A while back I wrote about how atomic line spectra can be used to determine the motion of a star or galaxy. This is possible because light from a moving source will become slightly redder (redshift) if the object is moving away from you, and slightly bluer (blueshift) if it is moving toward you. The entire spectrum of a star or galaxy shifts red or blue due to its motion, but we can use the line spectra to measure that shift. This shift due to relative motion is known as the Doppler effect. We can also use the Doppler effect to learn about how fast a star is rotating. As a star rotates, one edge of the star is moving toward us slightly, while the other edge of the star is moving away from us slightly. This means light from one edge is slightly blueshifted, while the other edge is slightly redshifted, as you can see in the figure above. As a result, some of the light from a spectral line is redshifted, and some blueshifted, which makes the line appear broader than it normally would. This effect is known as rotational broadening. Rotational broadening doesn’t tell us everything about the rotation of a star. The amount of rotational broadening we observe depends not only on the amount of rotation, but also on the tilt of the star relative to us. For example, if we view a star along its equator, then we can observe all of the rotational motion. If we viewed a star at its pole, we would see no rotational broadening. From the rotational broadening we can determine the minimum rotation rate of the star (if we assume we are looking along its equator), but it could be tilted relative to us and rotating more quickly. 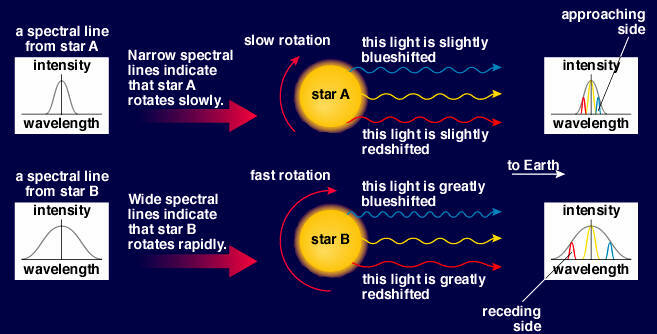 Sometimes we can gather other information about a star’s tilt, and use that to determine the rotational speed. But even without knowing the exact rotation, measuring the minimum rotation helps us learn about things such as starspots and a star’s magnetic fields.